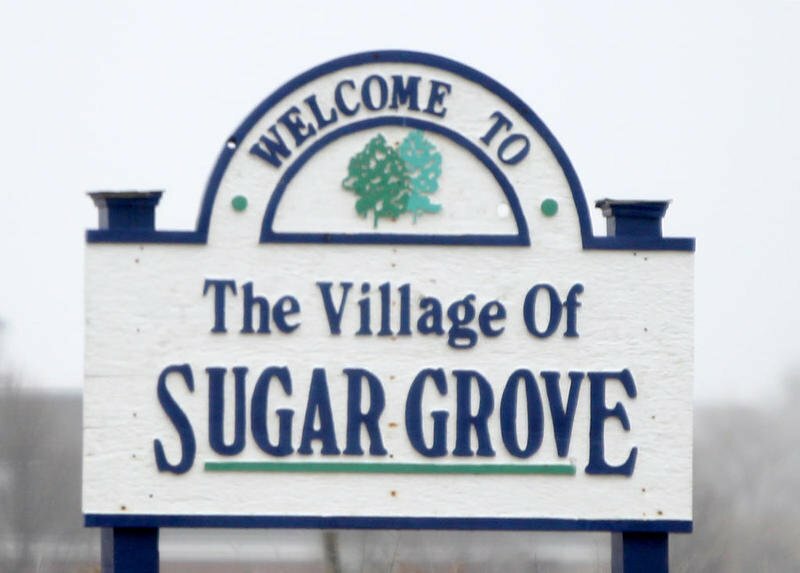 We at Hawken Locksmith Services (HLS) have been helping the local businesses and residents of Sugar Grove, IL for decades now. We are licensed with the IDFPR (License #191000873) in the state of Illinois, properly insured, and back our labor with a 30-day guarantee! Hawken’s offers fast hardware installations, affordable security upgrades, and even 24-hour emergency locksmith services in most cases. We have experience working with everything from vintage automobiles, to door closers and exit hardware, to advanced access control systems, touch pads, key cards, safes/vaults and more. Hawken Locksmith Services is near you in Sugar Grove, IL servicing the 60554 zip code from I-88 to route 30 to route 56 and even over towards 15. We have the training, speed, experience, and equipment to handle most door, lock & key issues on the first trip – both big and small. Attention Waubonsee Community College Teachers, Students & Staff! 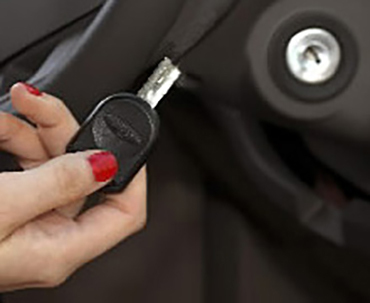 If You Need a Local Locksmith, HLS has You Covered. 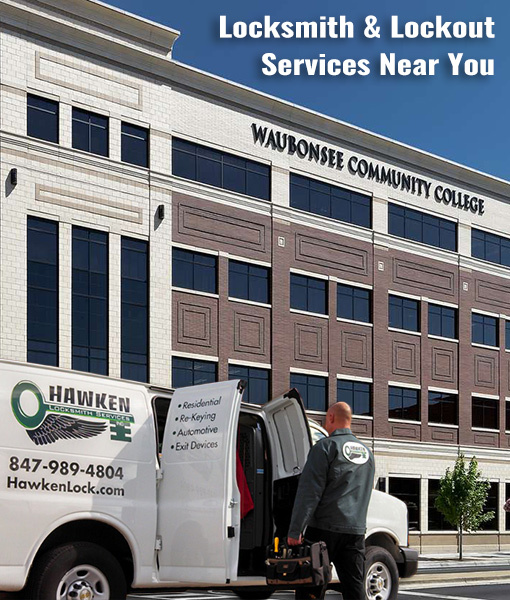 Our mobile locksmith van is fully stocked driving around Waubonsee Community College (WCC) area and ready when you need help. We can work around your school schedule because in most cases Hawken Locksmith Services is available 24 hours a day and 7 days a week. The Waubonsee Sugar Grove campus is located off Route 47 by Waubonsee Drive, with the zip code 60554-9454, and we just so happen to be minutes away! Rental Units – In Most Cases, We Make Our Emergency Locksmith Services Available 24 Hours a Day; Trustworthy and Dependable, We Are Your Go-To Locksmiths for Mailbox Locks, Lost or Broken Keys, Lockouts, Security Access, CCTV and More. 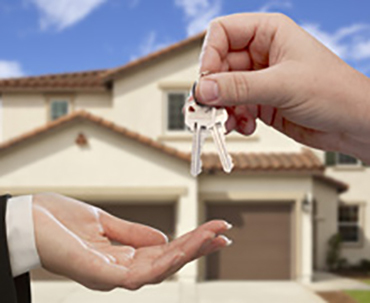 Property Managers & Homeowner Associations – Help is Always Available for Your HOA Members with 24-Hour Service Available in Most Cases; They Will See Increased Value in Your HOA Thanks to Our Reliable, Experienced Locksmiths. Contractors and Builders – Fire Department Compliant; Hardware Made for Special Situations; Key FOBS, Keypads, Aligned and Sturdy Deadbolts, and Locks for All Doors. Retail Stores & Manufacturing Facilities – Entrance and Exit Hardware; Access Control Limited to Those You Trust Most; Improve Security in the Midst of High Employee Turnover with Safes and Rekeyed Locks. CCTV Also Available to Reduce Theft. Realtors – Resolve Lock Box Issues Quickly with Fast Response Times; Tighten Security on the Properties You Show to Prevent Break-Ins; Dependable Go-To Locksmiths Ensure You Will Not Miss Out on Showings. Contact Hawken Locksmith Services NOW at 815-762-4464 or 847-989-4804 to speak directly with an actual Sugar Grove locksmith.